Discover Zurich’s well-preserved OLD TOWN with its medieval guild houses on foot during your orientation walk, before continuing to the Emmental Valley. Stop at the SCHAUKäSEREI AFFOLTERN to try out the locally produced cheese, and have a light lunch. 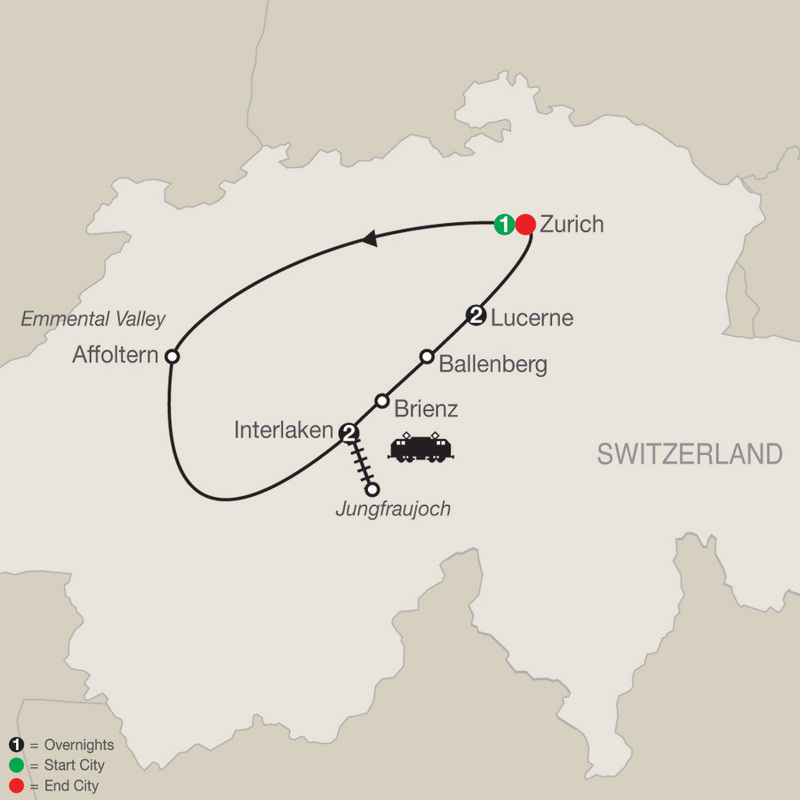 Then, continue your journey deep into the Alps and arrive in Interlaken. The town’s unique location, nestled between Lake Thun and Lake Brienz and surrounded by the world-famous Eiger, Mönch, and Jungfrau mountains, guarantees spectacular views. An unforgettable trip to the high Alpine wonderland of ice and snow is the true highlight of a visit to Switzerland. At an amazing 11,332 feet, the JUNGFRAUJOCH is Europe’s highest railway station. Jungfrau’s 13,642-foot summit was first ascended in 1811 and, in 1912, the rack railway was opened. Enjoy the Alpine Sensation, the Panorama 360° Experience, the ICE PALACE, and take the elevator to the Sphinx Observatory. Also receive your Jungfrau Passport as a souvenir to take home with you. The round trip to the “Top of Europe” by MOUNTAIN TRAIN will take most of the day. A scenic drive through charming mountains brings you to cozy Brienz, where you will visit the interesting WOODCARVING MUSEUM. Also walk through the romantic Brunngasse, once awarded the title “Most Beautiful Street in Europe.” A visit to the fascinating OPEN-AIR MUSEUM of Ballenberg has been included to marvel at the centuries-old buildings from all parts of Switzerland. Arrive in picturebook Lucerne, where you will stay for the next two nights. 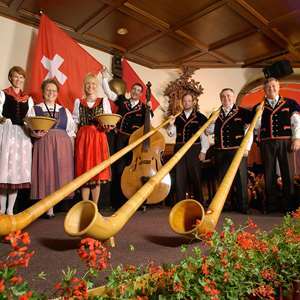 You may wish to join an optional folklore party with cheese fondue, yodeling, and alphorn blowing. Follow your Tour Director for a pleasant walk and admire Thorwaldsen’s LION MONUMENT, dedicated to the Swiss Guards who protected the Royal House of France during the French Revolution. Walk along ornate patrician houses of the walled Old Town, then cross the famous covered CHAPEL BRIDGE to the Jesuit Church, the first large baroque church built in Switzerland on the north side of the Alps. 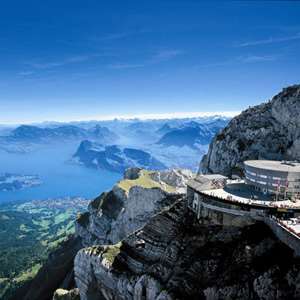 Later, an exciting optional excursion is available to Mount Pilatus, the “Guard of Lucerne.” This evening, a farewell dinner has been prepared to celebrate your vacation as the best way to say auf Wiedersehen. Explore the scenic wonders of sparkling Lake Thun during this memorable 1.5-hour boat cruise and free time in the storybook village of Spiez. Experience the awesome thunderous roar of the water as it rushes past you inside the mountain: these are the Trümmelbach Falls!